Well, it’s that time of the month again. Time for a little something called the Secret Recipe Club. Hosted by Amanda over at Amanda’s Cookin’ it’s a great way for bloggers to meet, share, and make each others’ recipes! Each month she assigns each participant a blog and we can make any recipe from that blog. Then, all at once, we reveal our posts! It’s quite fun. Who doesn’t like being in a secret club? Last month I made some excellent lemon poppy seed muffins by way of Connor’s Cooking. This month I was introduced to Darn Near Domestic, another fabulous blog – pause and head over there to have a looksy! While Kristy from Darn Near Domestic has a ton of appetizing recipes, I was short on time and so it was easy to choose one – I went straight for the PW Restaurant Style Salsa. I love me some homemade salsa and it was just the thing to bring to a barbecue I was attending. Besides, Kristy’s recipe was adapted from the Pioneer Woman, so I knew we were in good hands. This is the first salsa recipe I’ve seen that calls for canned tomatoes. I’m sure people do this all the time, but for me it was a bit of a revelation. While that’s great in winter (indeed, Kristy posted this recipe back in January), in summer it would be a crime not to include some beautiful fresh tomatoes (another aspect of the Secret Recipe Club is that we can adapt the recipes however we like). But I was intrigued by the use of canned tomatoes and so decided to go halvsies. The original recipe called for a large can of whole tomatoes and two cans of Rotel, which I learned is diced tomatoes with jalapeno. Instead I used Muir Glen fire-roasted diced tomatoes, which gave the salsa a smoky flavor that I just loved (for a completely homemade version you could roast some tomatoes yourself). It also made the prep that much quicker. Definitely a good time saver tip. The only other change I made was that I left the salsa chunky. Kristy calls for blending the salsa to make for a smooth, restaurant-style dip. I prefer mine with pieces of vegetables and, as mentioned, was short on time. Combine all ingredients in a medium-sized bowl. Season with salt and pepper to taste. Serve immediately, or, if you would prefer a smooth consistency throw it in the blender. Serve with tortilla chips and enjoy! Thanks for the great post! Question – did you make this recipe in Israel? If so where did you get the lime and muir glen tomatoes?! I live in the center and haven’t found either of these things… also do you find jalepeno’s in the regular supermarket or it tends to be in the shuk? Hi Samantha! Sorry for the delayed response, vacation has gotten the best of me 🙂 I have to admit I made this in New York (home for the summer). I hear that limes have been spotted in Jerusalem recently but they’re only around for a brief time each year! Very sad for me. I think I’ve actually seen Muir Glen at my local health food store but I could be wrong. And I’ve seen jalapenos in both the shuk and the supermarket, they definitely always have them in the super. In the restaurant we always used canned tomatoes, simply makes it easier 😉 At home, I go about 50/50 depending upon the time of year and whether I can find good tomatoes or not. I definitely (almost always) prefer chunky salsa. Fire roasted tomatoes, brilliant! Looks delish! Ah, it looks delicious. I think roasting the tomatoes is a stroke of genius. I can imagine how it would add some complex flavours to the salsa. The first time I made the PW salsa, I had a revelation too! Who knew you could use canned tomatoes! Definitely comes in handy in the winter. Your salsa looks delicious and I bet the fire-roasted tomatoes were awesome in this! 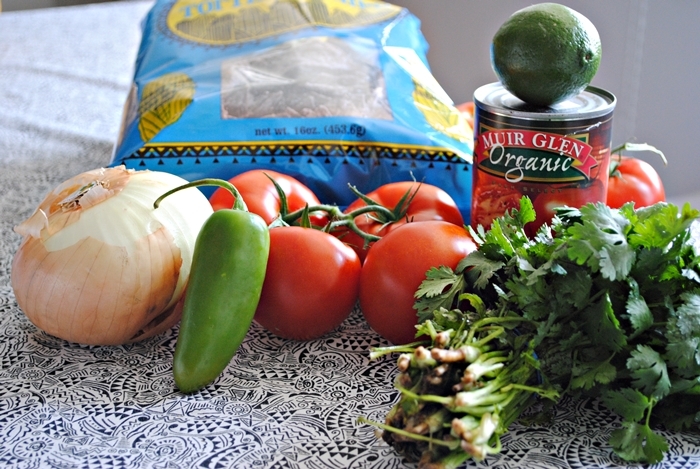 What a simple pretty salsa – I’ll have to keep this in mind when fresh tomatoes are not in season! 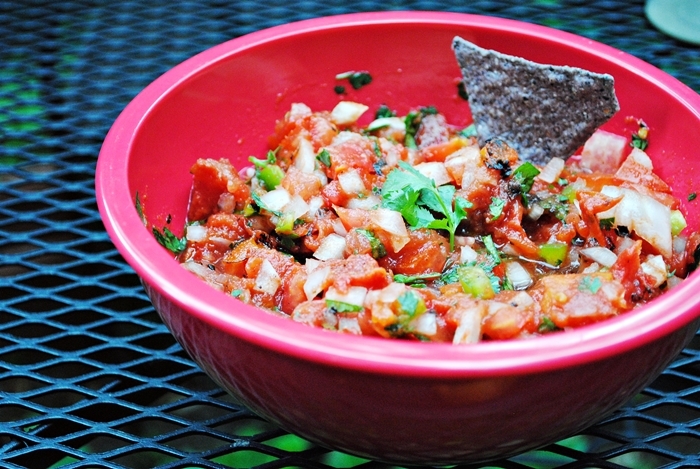 homemade salsa is the best – and fresh cilantro in the mix just bumps it to the highest level ever! I love your “summery” adaption to this recipe…I bet the fresh tomatoes were a great addition! Perfect Summer tastes – fresh tomato and corriander. Looks great. I use those fire roasted tomatoes all the time, gorgeous! Thank you for the lovely post you wrote! Glad you enjoyed the salsa. I think you’re right, fresh tomatoes in the summer is perfect! This salsa sounds wonderful! So fun to be in the Secret Recipe Club with you. Great idea to combine the fresh and canned tomatoes – I’ve only ever made one or the other. And I love fresh homemade salsa. Good choice! I love homemade salsa. This looks like a great one to try!